The safest way to swim is with a lifeguard on duty, but many people swim at hotels, apartment complexes or private homes without guards, so they should know a little about basic rescues. This is not complete instruction in rescuing drowning victims, but is a supplement to a lesson I give my classes on how almost anyone can possibly save someone in trouble in the water, without entering the water, using just their hand or equipment commonly found at swimming pools. First you need to realize that people who are drowning can’t yell for help. Someone who got a cramp in their leg might be able to call out for help, but someone actually drowning can’t yell or even talk. Let’s use the example of someone who can’t swim who is pushed into the pool by a friend playing with them who does not know that they are a nonswimmer. They could end up only a foot from the side of the pool, but they will not be able to reach or get to the side. They will be upright in the water, pressing down hard with both arms to try to get their head up out of the water to get a breath. They will come up and go under as they instinctively push with their arms. Their head may be tilted back and they may not see you. They may not hear you trying to yell at them. People can struggle like this and stay at the surface for only 20 to 60 seconds, so anyone who wants to help them needs to move quickly. 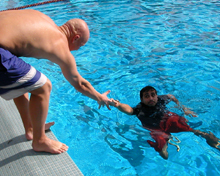 A potential rescuer must understand that only trained lifeguards should try to swim out to a drowning victim, and even trained guards are often at risk when they do so. If you wanted to help someone struggling as described, you should first start yelling for help (even a lifeguard will notify others when s/he does a rescue). If someone near the pool edge has a cramp, and is not struggling, you can talk to them or gesture to them that you are trying to help them. person out of the water. If the person in trouble in the water is very close to the side, lie down on the deck or pier/dock surface, spread your legs out wide for stability, and reach for them. Yell to them to “grab my wrist” as you try to grab their wrist or upper arm and then carefully pull them in. Keep your body low, and lean back to avoid being pulled into the water. By grabbing wrists you get better hold on each other. Reaching for a hand/fingers is not as secure. The next photo shows the wrong way to do a reaching assist. The potential rescuer could easily be pulled into the water. Your personal safety is of the utmost importance, lie down on the deck. If the person in trouble is too far from the side to reach easily while lying down, you can use a shepherd’s crook (also known as a life hook) to extend your reach. Most pools should have one on the wall or at a lifeguard stand. This long aluminum or fiberglass pole has a curved hook on the end that you can put where a person in trouble can grab it or can wrap around a victim to save them. Again, you should yell for help. Warn others on the deck to stay clear from the back end of the crook, and be careful as you use it that you don’t poke anyone behind you. Stand away from the edge and brace your legs so that you won’t fall in the pool if the victim grabs the crook hard. The shepherd’s crook is very flexible and can feel awkward the first time you use it, move carefully. Then dip the crook down in the water and place the curve where the victim can reach it. You should put the crook IN the water as you move it towards the victim. The pole is wobbly and if you try to move it in the air you risk hitting the victim in the face. You might even gently try to get the victim to notice it by pushing the crook at their waist, but certainly move carefully and slowly enough that you do not hit them in the face. Be prepared for a sharp tug on the crook when they find it. BUT do not completely rely on them being able to see and/or grab the crook (see below). Notice the victim in the pictures below going up and down in the water as he pushes and tries to get air. If you try to rescue a victim struggling in this manner, you will have to aim the crook carefully. If they can not grab the crook, or do not see or feel it, which frequently happens, dip the crook deeper in the water and swing it around behind the victim to pull them in. You should place the curve of the crook around the back of their chest below the armpits. Do not put it up at the neck! You won’t be able to see exactly where the crook goes, and it’s okay to rescue them by the waist or even the buttocks if it works. Slowly and carefully pull them to the side. If you pull too quickly you might jerk the crook from their hands or hurt them. 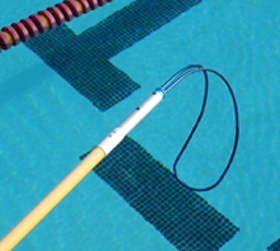 If they were struggling and you had to wrap the hook around them, don’t pull so fast or hard that you slam them into the side of the pool. If you had to wrap the hook around them, they might not notice that they are being rescued, so when you get them near the side, push the crook away from them, lie down and do a reaching assist as described above. After such a rescue of a struggling victim, the victim should see their doctor or go to an emergency room immediately, as there is a serious probability that they may have breathed in water, which can be life threatening. If there is no shepherd’s crook, you might use other reaching equipment, such as poles, oars, paddles, tree branches, shirts, belts or towels. You take more risk if you try this next reaching assist, but if no equipment is available and the victim is too far away to reach by lying down on the pool deck, you could hold onto something secure in the water with one hand and extend your arm or leg to them. 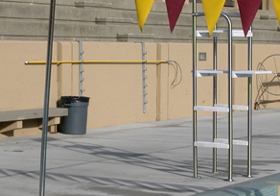 Examples of potential secure places to hold on include the gutter (overflow trough), pool ladder, piling, or in the pictures below, a starting block. Do not let go of the secure object or swim out into the water. Pull the victim to safety. Fremont High School instructor Aaron Eeg extends a hand to Homestead High’s Lisa Nakamatsu and Cupertino High School coach Sarah Hovland reaches a bit farther by extending her leg to Homestead High coach Harry Coryell. Do not attempt any rescue skill that you do not feel confident using. In my classes we practice these skills. People reading this online might want to practice as well, before they need to use the skill. From now on, when you go to a hotel, apartment or other new-to-you pool, look for the shepherd’s crook first thing when you get there. There are other ways to do such a rescue and your local Red Cross can recommend a complete water safety or lifeguard training class. 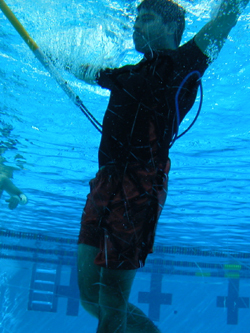 Information about lifeguard training is at Lifeguard Training FAQs .